Perioperative microglial depletion prevents surgically induced memory loss in mice. (A) Representative hippocampal immunofluorescence images including Iba1+ cells (green) and nuclei (DAPI; blue) from mice following tibial fracture, showing marked depletion of hippocampal microglia in response to PLX5622 treatment for 7 days before surgery and 3 days following surgery. Scale bars: 50 mm. (B) Quantification of the extent of microglial depletion in A (n = 6/group; *P < 0.01 vs. control by two-tailed Student’s t test). 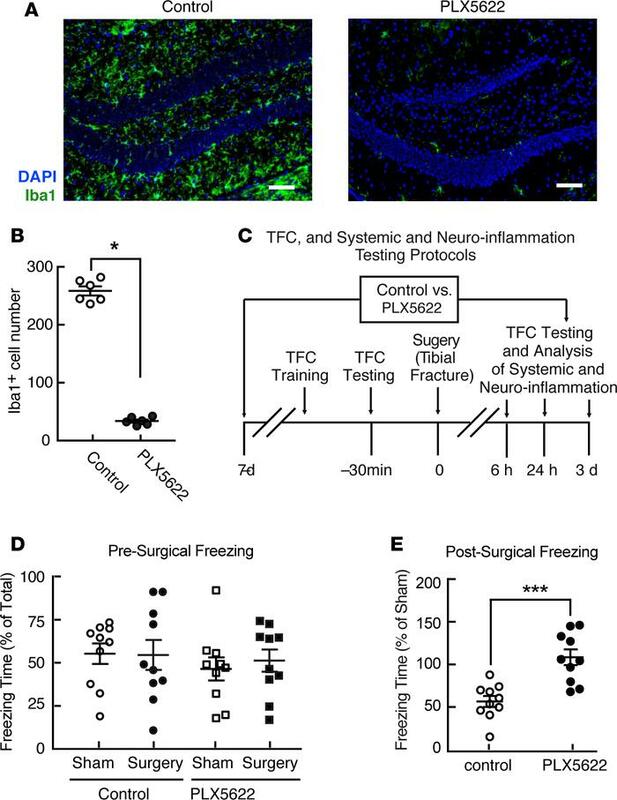 (C) Schematic, depicting the protocol for preoperative trace-fear conditioning (TFC) training, TFC testing, experimental surgery, and postoperative analyses of both hippocampal and systemic inflammation and the memory of preoperative associative learning. (D and E) Freezing in response to contextual cues, expressed as a percentage of total time in the testing environment prior to surgery (D) and relative to that of appropriate sham-treated controls3 days following surgery (E). Data in D were analyzed by two-way ANOVA. Data in E were analyzed by two-tailed Students’ t test (***P = 0.0002 for surgery vs. sham-treated control). For both D and E,n = 10/group.